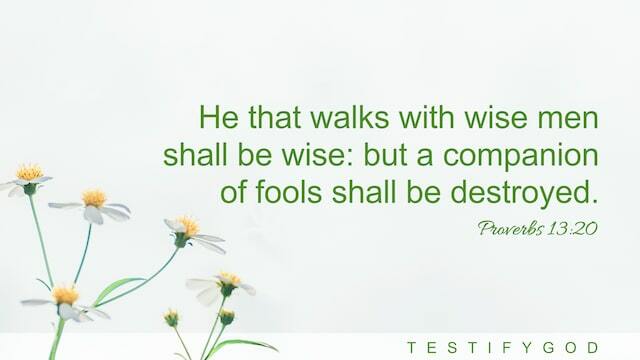 This verse tells us what kind of people we associate with is wise. If we make friends with wise men, we’ll be wise. If with fools, we’ll surely be destroyed. Then what kind of people are wise? And what kind of people are fools? The Bible says, “The fear of Jehovah is the beginning of wisdom: and the knowledge of the holy is understanding” (Proverbs 9:10). From it we can see that those who can fear God and have knowledge of Him are wise. Just as when the Lord Jesus came to do His work at the Age of Grace, those who followed Him were wise men. For example, Peter, John, Jacob, they followed Jesus at once when they heard His voice, so they were wise men. If we associate with such kind of people, we’ll have the chance to obtain God’s salvation.Whereas, the Jewish chief priests, scribes and Pharisees didn’t have a God-revering heart, much less did they know God. So they were fools. Though they listened to Jesus’ preachings, they didn’t seek or investigate to accept the truths but found fault with Him, resisted and condemned the Lord Jesus, nailed Him to the cross. As a result, they were punished and cursed by God. If we follow such people without discernment, we shall be destroyed, and even cursed and punished by God. It is the last days of Jesus second coming. How to distinguish between wise men and foolish ones is a major thing that affects whether or not we can be saved. The Lord Jesus prophesied, “And at midnight there was a cry made, Behold, the bridegroom comes; go you out to meet him” (Matthew 25:6). When someone testifies that Jesus has returned, only wise virgins can recognize the voice of God and welcome Him. They themselves not only welcome the reappearance of Jesus, but also can lead brothers and sisters to seek and investigate God’s work of the last days, and gain His salvation in the last days. Conversely, when those stubborn foolish virgins hear the voice of God, they don’t accept, but block brothers and sisters from seeking and investigating the true way, thus losing God’s salvation in the last days. Such people are foolish. Obviously, it is really important to walk with wise men. John 20:19 Then the same day at evening, being the first day of the week, when the doors were shut where the disciples were assembled for fear of the Jews, came Jesus and stood in the middle, and said to them, Peace be to you. Reflection: Whenever I read this verse, I cannot help but ponder: Though it happened thousand years ago, what was the significance of Jesus’ resurrection? Why did He appear to people after His resurrection? From a spiritual book, I have read one passage: “And when He walked out from the grave, and appeared to the people one by one, the majority of people who had seen Him with their own eyes or heard the news of His resurrection gradually shifted from denial to skepticism. By the time the Lord Jesus had Thomas put his hand into His side, by the time the Lord Jesus broke bread and ate it in front of the crowd after His resurrection, and after that ate broiled fish in front of them, only then did they truly accept the fact that the Lord Jesus is Christ in the flesh. … This brief reunion made the people who saw the Lord Jesus feel as if a lifetime had passed. Their lost, confused, afraid, anxious, yearning and numb hearts found comfort. They were no longer doubtful or disappointed because they felt that now there was hope and something to rely on. The Son of man standing in front of them would be behind them for eternity, He would be their strong tower, their refuge for all time.” God examines the innermost heart of man. Jesus knew that His disciples followed Him, but they didn’t believe that He was the incarnate God, much less the fact of His resurrection. Thomas was the classical example. After he touched Jesus’ wound in His rib and nail marks in His hands, Thomas’ doubt of God disappeared. Hence, Jesus’ appearance to people was to make those who followed Him truly believe that He is the incarnate God and is the Lord who created the heavens and earth and all things. Although He was nailed to the cross, He had the power of resurrection. From these, we can see God’s authority, strengthen our faith, and truly rely on Him on our path of following God. » Read more in these articles: • 3 Aspects to Unravel Mystery of Incarnation of Jesus • What’s the Significance of the Lord Becoming Man’s Sin Offering? • 3 Truths About the Resurrection of Jesus Christ We Should Know » Most people also watch: The Lord Jesus’ Words to His Disciples After His Resurrection Peace be with you all! Dear brothers and sisters, if you have any understanding or enlightenment from God, you’re welcome to share with us.1. Via the online chat window at the bottom right corner of the screen.2. Send an email to info@testifygod.org.We sincerely hope we’ll grow spiritually through sharing with each other.